You’re probably already convinced of the importance of translating your Shopify store, so what we’re going to do here is take a closer look at why Bablic is hands-down the easiest and most powerful way to get the job done. There are a lot of localization solutions, but we believe Bablic stands out from the crowd. We’ll show you four reasons Bablic is the simplest and most effective localization solution for translating your Shopify store. When it comes to growing your business, it’s the ROI (Return On Investment) that counts. Most website localization solutions on the market are either so expensive that the expense is hard to justify for an average Shopify store, or so limited in their functionality that they don’t let you create a satisfying experience for your customers in all the languages they might speak. That’s where Bablic comes in. 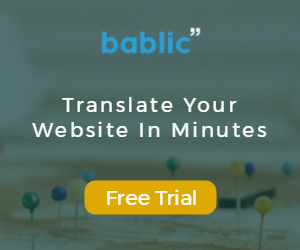 Bablic combines a cost-effective solution with a 100% professional outcome, which includes multiple translation options and many other localization features that other Shopify store owners have told us are essential for them. You can take a look at a few of these in more depth here. With Bablic, you can add a language to your Shopify store and test-drive a brand new market for as little as $24 a month. If you’re still undecided, Bablic offers a 14-day free trial, so you can test the full solution for free before making a decision. We think the quality and ease of use speak for themselves, and Bablic’s affordability is another great reason to make us part of your business’s international success story. Many people get confused between translation and localization. Localization, in simple terms, is the process of tailoring the user experience to meet the needs, culture, and preferences of a specific audience. Translation of text is just part of this process. What else is involved? A complete localization solution includes customizing images, videos, adjusting styling issues (page layout, page orientation, colors etc. ), right-to-left adjustment, and much more. Lots of website translation software only offers translation services. Bablic’s powerful visual editor, on the other hand, lets you localize images and videos, manually edit translated text, switch page direction, translate URLs, fix styling and CSS issues, and many more advanced features that put you in the driver’s seat, all through a very simple and user-friendly interface. The number one thing we love hearing from satisfied users is that Bablic is incredibly easy to use. Many users were dreading the move toward localization and then found the process to be supremely simple and intuitive. Integrating Bablic into your Shopify store takes less than a minute, and just a few clicks. And we provide a quick getting started guide to make it all easy. You won’t need to do any programming or tweaking of your store’s code, all you need to do is activate a plugin or paste a single line of code in your site. Easy-peasy. Finally, we’ve found that users really appreciate the fact that Bablic is universal. That means it’s compatible with all CMS platforms on the market. So whatever platform you choose to run your store, whether it’s Shopify or WooCommerce, Weebly or any other platform, you can always count on Bablic to localize your store without any headaches. And if you need to migrate from one platform to another, Bablic can go with you, making the transition simple. What’s Bablic all about? Affordable, simple, hassle-free, powerful, and universal. In other words, Bablic speaks your language—to help you speak your customers’ languages, whatever those might be. Bablic is one of the simplest, most cost-effective ways to both translate and localize your Shopify store, while making the process easy so you can get back to running things. Thousands of e-stores are now using Bablic to expand their customer base internationally, and more are getting on board every day. Are you ready to boost your sales and grow your business?